Sega continues to spare no expense. 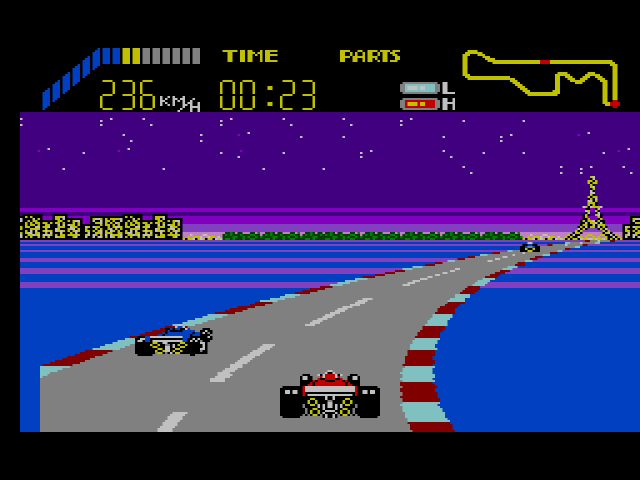 There’s only so many ways one can design an 8-bit racing game: a glowing city-scape here, sharp turns there, and aloof AI everywhere. But even with such a limited template, the quick shiftin’, ’round the world hedonism encountered in World Grand Prix felt very familiar. 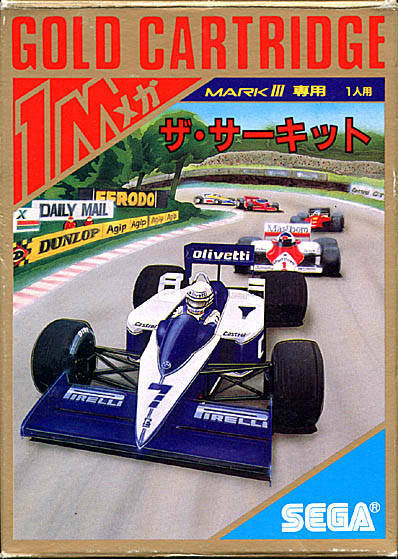 After some brief sleuthing, I discovered World Grand Prix is a loose update of GP World, one of the few decent SG-1000 racing games. Good news, everyone? Sure, especially if you lived outside of Japan and didn’t own an SG-1000, which is pretty much everyone. 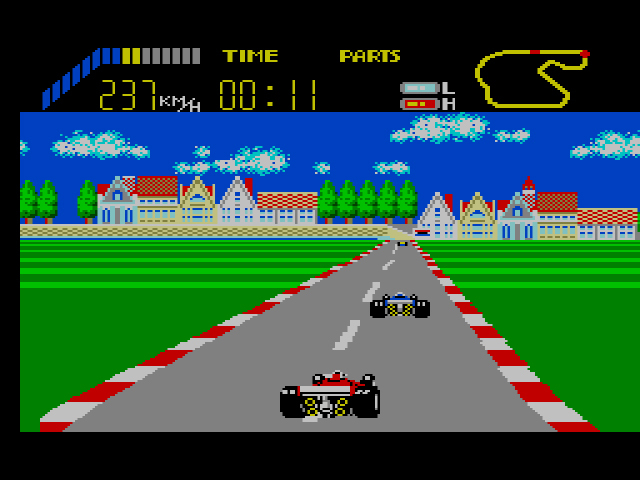 The upgrade is mostly graphical, though Sega did tweak the time qualifications for passing a course and added the ability to soup up your car. Most importantly, like its predecessor, World Grand Prix offers up steady arcade thrills for common folk and racing fiends alike. Once you’ve picked a difficulty, you’re off and racing. Button II gives you gas, Button I stamps the brakes, and pressing ‘Up’ and ‘Down’ on the D-pad will shift your gears. Like GP World, you’re not racing against anybody or anything, except a time limit; the other cars are on the track to make you crash and be a nuisance, nothing more. Each track has a qualifying time. Complete the race before the time is up and you’ll move on to the next race and acquire some points. The faster you complete the race, the more points you receive. Once you acquire a hundred points, you’ll be whisked away to The Make-Car-Go-Faster Shop and given the option to purchase additional acceleration, handling, or a stronger engine. Stick with the acceleration and engine. 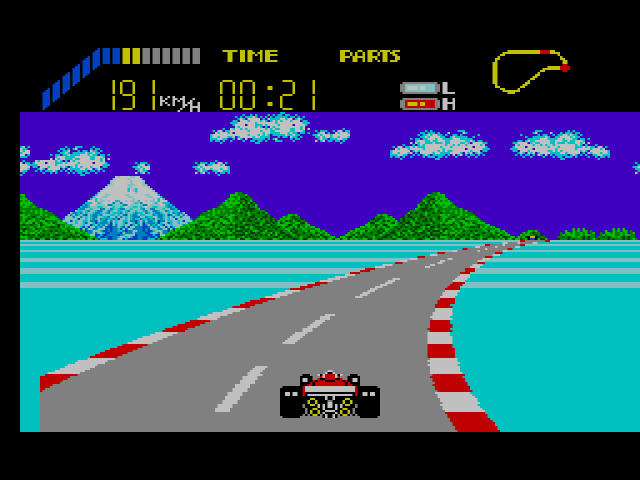 The game already controls tight enough without the handling, and the more speed you can acquire before the later races, the better. World Grand Prix doesn’t have much in the way of options. Despite Sega’s stance on including two-player in all of its games, the option to play against another is strangely absent here (not that that’s a big loss – alternating two-player is one of the biggest shams of early gaming). Three difficulty levels and an edit mode are all you get, but given the game’s 1986 release date, it’d be strange to expect much more. The edit mode is exactly the same as the one found in GP World. Tracks are constructed with the limited amount of pieces the game gives you, and unless you connect the track’s two ends, you won’t be able to drive on it. It’s ok, but just like in GP World, you can’t save your creations, so there’s little point beyond curiosity. This was my bland custom track. Steady as she goes. 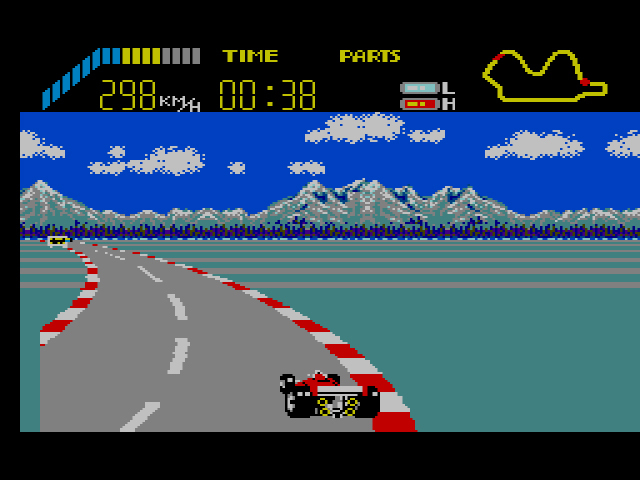 If you’ve ever test-driven Hang-On on the Master System, you’ll know what to expect from World Grand Prix. Save for the slightly heavier car physics found in World Grand Prix, the two games play almost identically. Some might say the similarities between games is just Sega spinning its wheels (zing! ), but I would argue that World Grand Prix improves upon Hang On. The latter has sloppy handling and doesn’t compare to the majesty of riding an actual motorbike cabinet in the arcade. The former has tighter controls and is an update to a technically inferior SG-1000 game that nobody played. Neither game would wow audiences today, and in fact, one could make the case that both are quite sterile and average. But if you gotta cruise to Paris at 300 kilometers-an-hour, do it in a car that you can “trick” out. Jay-Z would want it that way.